Holding history that starts in 1967, Mini and John Cooper’s cooperation have been rolling dices and winning hearts of their buyers. To keep the light of tradition on, they have recently shared the all new Mini John Cooper Works 2016. Housed with more powerful engine and aggressive looks, the model undoubtedly is a treat for its buyers and the automotive industry. Let us have a descriptive look at it through the review of Mini John Cooper Works 2016, to know more about it. 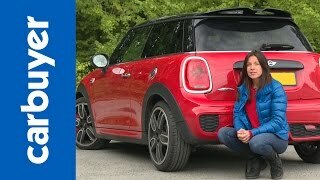 Talking about the interior of Mini John Cooper Works 2016 I would say it is far sportier in comparison to its predecessors and not only this but also more spacious. When I say spacious this includes vast leg room and the luggage compartment for a comfortable ride without compromising with the luggage. Now let us talk about the features and find out if the features inside it. The model is equipped with newly created sports seats that come with integrated headrests and better bolstering to offer more comfort without compromising with looks. Talking further you’ll have a new leather-wrapped, three-spoke multifunction steering wheel enhancing the top while branded side sills keeping the glory of bottom accompanied by the shining stainless-steel pedals. 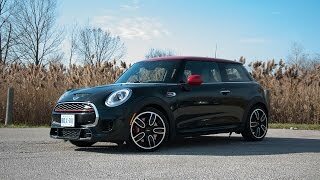 In all rounding up the interior details of Mini John Cooper Works 2016 I would say the red and black drenched model looks impeccable with all its features and inclusions. Just like its interior, the exterior of Mini John Cooper Works 2016 gets rounds of upgrades. Starting with the front fascia the honeycomb pattern grille sits loud amidst the headlamps that are joined with LED daytime running lights. There are massive air inlets beneath, integrated in bumper to keep the highly powerful engine calm. Moving towards the rear end you’ll notice massive 17 inch wheels beneath those muscular wheel arches. While the back side, we have two outlets for diffuser with center mounted exhaust tips, there are two more massive outlets giving the touch of sportiness. The tailgate and the taillights also get a new shape to compliment the overall looks. Getting back to the wheel arches you’ll be noticing the black contours over it that makes it look distinct and also the side skirts that add to glory. 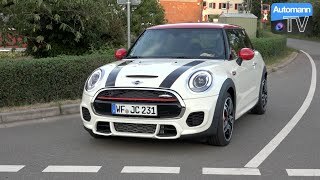 In all rounding up the exterior details of Mini John Cooper Works 2016 I would say these all with the big list of options make this model unmatched and distinct with its looks. Beneath the hood of Mini John Cooper Works 2016 is a 2.0 liter four-cylinder petrol engine with MINI Twinpower Turbo technology. The engine cranks total output of 231 hp and peak torque of 320 nm paired to six-speed manual or six-speed automatic transmission. 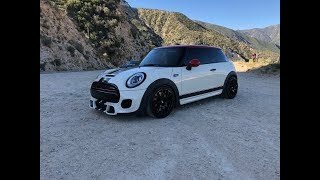 With the power thus created the top speed of Mini John Cooper Works 2016 touches the mark of 153 mph while the 0-62 mph sprint gets knocked in just 6.3 seconds with manual transmission while it takes 6.1 when paired with automatic transmission.